Delaunay-Belleville built luxury cars in a Parisian suburb beginning 1904 and lasting into the 1920s. They were cars for (and purchased by) kings, and are well-known for their dinstinctive cylindrical engine compartment and round radiator. It is powered by a 2.6-liter straight-six. Unlike many of their cars, this Delaunay-Belleville was boded in America – New York to be exact, by Brewster. It’s an open Victoria, a body style that is not at all practical nor was it popular by the time WWI ended. The driver is always exposed to the elements, and the rear convertible top only protects the passengers from the sun. When the sun is behind them. I guess it’s great for bald guys who don’t want their head to burn but don’t mind getting rain/bugs/birds in their face. Only 185 examples of the Type IA6 were built, and this one has been in the same ownership since 1975. The restoration dates to 1983 and appears to have held up well. It’s a great ticket into many great car shows and is being sold at no reserve. Click here for more info and here for more from this sale. 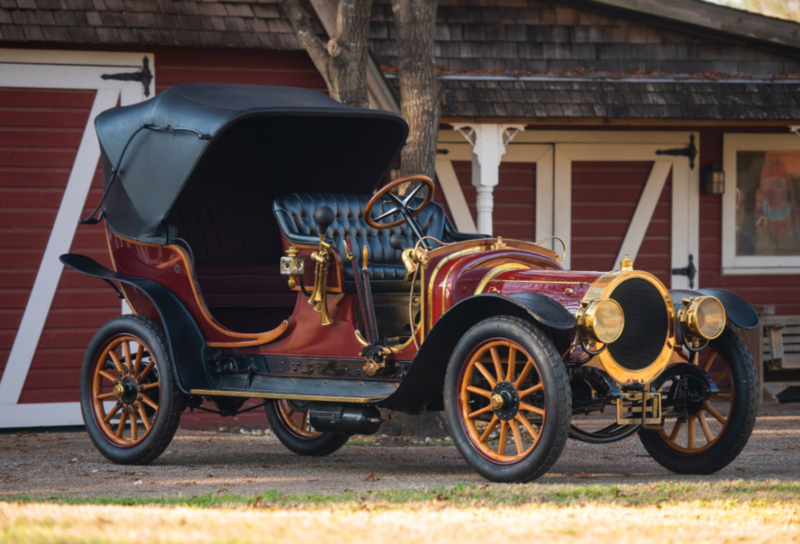 This entry was posted in Uncategorized and tagged 1909, auctions, brewster, cars, classic cars, delaunay-belleville, rm sothebys, Type IA6, victoria by classiccarweekly. Bookmark the permalink.